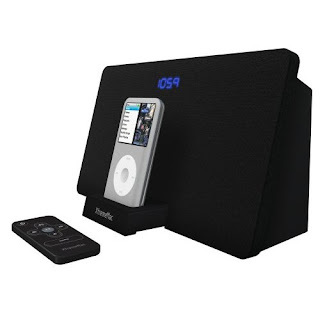 iPod speakers is a must-have gadget for those who can't live without their iPods. Whether you’re an audiophile or just a casual music listener, there are a variety of iPod speakers out in the market that would suit your needs and the XtremeMac Tango Studio iPod speakers is one of them. Because iPod owners are naturally stylish, it’s important that their iPod speakers would scream style. The XtremeMac Tango Studio scores a point for design. Though its style is minimalist the black rectangle with blue digital clock screams simple but chic. I could definitely see the XtremeMac Tango Studio Speakers matching any décor whether it’s a bachelor pad or a college dorm room. At just $60 (from most major online stores), the XtremeMac Tango Studio speakers is a budget speaker so don’t expect any fancy features. You’ll find a retractable iPod dock, built-in FM radio, auxiliary jack, and a wireless remote. The XtremeMac Tango Studio speakers would fit any iPod and it even works with the iPhone if you put the iPhone in airplane mode. The audio quality of the XtremeMac Tango Studio speakers is what you can expect from iPod speakers at this price range. It’s nothing to wow about as it lacks bass but it’s good enough to use on your night stand, office cubicle or dorm room if you just want something playing on the background. Though the XtremeMac Tango Studio Speakers is just $60, I was still expecting it to have an alarm clock function. I guess it was the blue LED digital clock on its front that made me expect that it might have an alarm clock function. The XtremeMac Tango Studio Speakers also lacks a radio preset. You have to manually surf through the FM channels using your remote so if you’re a bit lazy surfing then you better pick out a favorite radio station if you still haven’t done so. Though it lacks the alarm clock function and radio presets, the $60 price plus the sleek design makes the XtremeMac Tango Studio speakers one of the better iPod Speakers at this price range.